This one-of- a-kind device is a cell phone transmitter, assistive listening device, media streamer, and hearing aid remote all rolled into one. 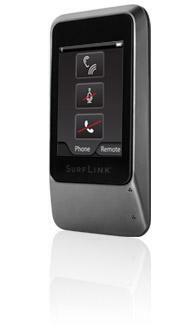 True hands-free cell phone conversations are here, thanks to our innovative new SurfLink Mobile with JustTalk. This one-of- a-kind device is a cell phone transmitter, assistive listening device, media streamer, and hearing aid remote all rolled into one. Wirelessly streams sound from any Bluetooth®-enabled TV or MP3 player.